No contract exists between you and Bee Crafty for the sale of any goods until Bee Crafty has received and accepted your order and you have been issued confirmation. Once Bee Crafty does so, there is a binding legal contract between us. The contract is subject to your right of cancellation (see below) and Bee Crafty reserve the right to refuse to accept orders from any individual or company at its absolute discretion. Bee Crafty may change these terms of sale without notice to you in relation to future sales. The description and the price of the goods you order will be as shown on the Bee Crafty website. All drawings, descriptive matter, specifications contained on Bee Crafty’s website are issued for the purpose of giving an approximate idea of the goods described in them. They will not form part of this contract. The goods are subject to availability. If on receipt of your order the goods you have ordered are not available in stock, Bee Crafty will inform you as soon as possible, send the missing items when they come into stock, refund you for any sum paid by you or if a suitable replacement is available it will be sent. Every effort is made to ensure that prices shown on Bee Crafty’s website are accurate at the time you place your order. If an error is found, Bee Crafty will inform you as soon as possible and offer you the option of reconfirming your order at the correct price or cancelling your order. If you cancel, Bee Crafty will refund or re-credit you for any sum that has been paid by you or debited from your credit card for the goods. The price of the goods are inclusive of VAT where applicable. Payment for the goods can be made by any method shown on Bee Crafty’s website at the time you place your order. All Transactions must be in Pounds Sterling. If delivery cannot be made to your address, Bee Crafty will inform you as soon as possible, and refund or re-credit you for any sum that has been paid by you or debited from your credit card for delivery. Every reasonable effort will be made to deliver the goods as soon as possible after your order has been accepted. Dates specified by Bee Crafty for delivery of the goods are intended to be an estimate. Bee Crafty will not be liable for any loss or damage suffered by you through any reasonable or unavoidable delay in delivery. Although Bee Crafty strives to post your order ASAP, please allow 20 working days from the date of despatch, if your order has not arrived please contact Bee Crafty where claims will be made to Royal Mail, as the recipient you will need to sign a document of non-receipt from Bee Crafty and also a claim form from Royal Mail. Once these have been processed by Royal Mail your order will either be resent or refunded. Faulty items will be exchanged but it is your responsibility to return them to us. Replacements will only be dispatched upon receipt of the faulty item. Discrepancies with your delivery should be reported to us within two working days of receipt. Always give a correct e-mail address when placing an order so that we can readily notify you of any problems and keep you in touch with your order progress. You have the right to cancel the contract at any time up to the end of seven working days after you receive the goods. To exercise your right of cancellation, you must give written notice to Bee Crafty by hand or post or email, at the address, telephone number or email address shown, giving details of the goods ordered and their delivery. If you exercise your right of cancellation after the goods have been delivered to you, you will be responsible for returning the goods to Bee Crafty at your own cost. You must take reasonable care to ensure the goods are not damaged in the meantime or in transit. 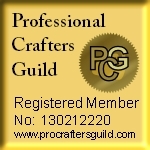 Upon receipt of the goods Bee Crafty will refund the retail cost of the items on the proviso they are in the condition in which they were at sale. You do not have the right to cancel the contract if the order is for goods which by their nature cannot be returned or are liable to deteriorate or expire rapidly. Bee Crafty will notify you at the time your order is accepted if this applies. Bee Crafty will take all reasonable precautions to keep the details of your order and payment secure, but unless Bee Crafty is negligent, Bee Crafty will not be liable for unauthorised access to information supplied by you. Bee Crafty may use the e-mail address you provide to alert you to offers or upcoming events at bee crafty you can opt out of this at any time by sending a STOP e-mail to shop@beecrafty.net.